The City of Elk Grove will implement temporary traffic controls in east Elk Grove on Saturday, May 6 for the 60th annual Elk Grove Western Festival Parade. Traffic Delays & Detours: A traffic plan has been created and road closures and detours will be in effect for parade staging beginning at 7 am. Roads used for the parade route will be closed from approximately 9 a.m. to 1 p.m. or until the parade has reached its end point at Elk Grove Regional Park. · Eastbound (E/B) and Westbound (W/B) Elk Grove Boulevard will be closed from Emerald Oak Drive to Elk Grove Florin Road. · Northbound (N/B) and Southbound (S/B) Elk Grove Florin Road will be closed from Elk Grove Boulevard to Park Meadows Drive. · Valley Oak Drive will be closed at Elk Grove-Florin Rd. Alternative Routes: Motorists travelling north or southbound are encouraged to use East Stockton Boulevard or Waterman Road during the closure. Bond Road or Grant Line Road are recommended for motorists travelling east or west bound during the event. For details about the parade and the Elk Grove Western Festival, visit www.elkgrovewesternfestival.org. For questions or concerns before or during the parade, please contact Parade Director, Lynden King at 916-686-5054. 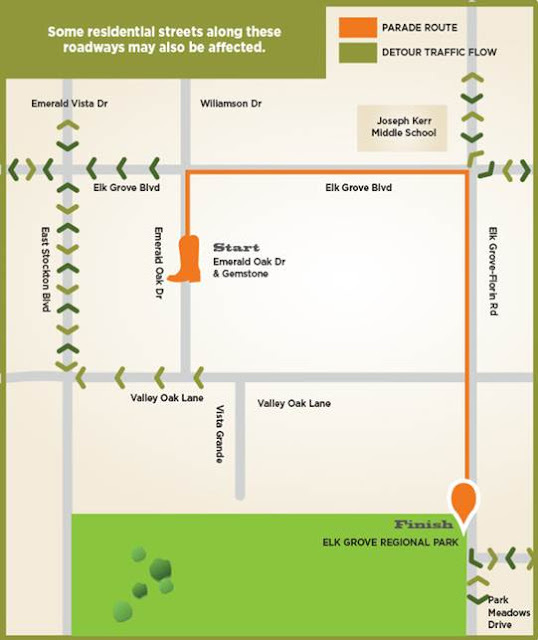 No Comment to " Traffic Detours, Delay Expected in Elk Grove For Western Festival Parade "